Thumbing through Fine Cooking issue no. 79, I found an article on berry desserts that I had passed over and forgotten. The article incudes a butter dough recipe that you can use to make a few different desserts. One suggestion is a fruit tart using the dough for the shell and a mix of lemon curd folded into whipped cream for the filling. 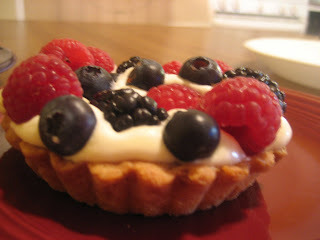 The tart is finished with fresh berries. You could use this dough to make eight little lovely tarts. 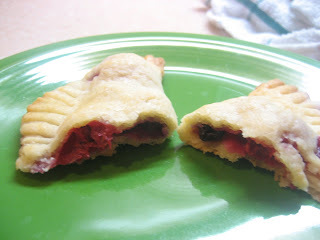 Another possibility with the dough is it to use it to make hand pies or what FC editors dubbed "Rustic Raspberry Turnovers." If you use the dough for this recipe, it will give you 12 turnovers, maybe more with scraps rerolled. I, feeling especially frisky one recent afternoon, decided to try both recipes by making just two tarts and using the rest of the dough to make turnovers. This Buttery Shortbread Pastry Dough is delicious and worked really well for both recipes. The little turnovers are made from circles, 4 inches in diameter. You can only fit 3 or 4 sugared raspberries in them (5-6 blueberries, I made some of both.) The crust is like a flaky cookie, and the bright tart berries play off its buttery sweetness. These were great for a few days, just sitting on the counter. Dear husband took them to work for a snack. As for the fruit tarts, the lemon curd/whipped cream was a revelation. I loved it with the berries and it was so easy using jarred lemon curd. You could easily have the tart shells and the lemon whipped cream made in advance and assemble these tarts right before you need them. Also I think children would enjoy assembling them, spooning in the cream and decorating with berries. And the shells are sturdy enough that you wouldn't need to worry about them breaking. Yum - I went back to that issue to see if I had made those tarts because they looked familiar. I did, and I loved them. I never did get to the turnovers but I like your idea of using blueberries instead of raspberries. I perused the issue again - this was a particularly good issue but I didn't cook from it enough! Thanks for the post. 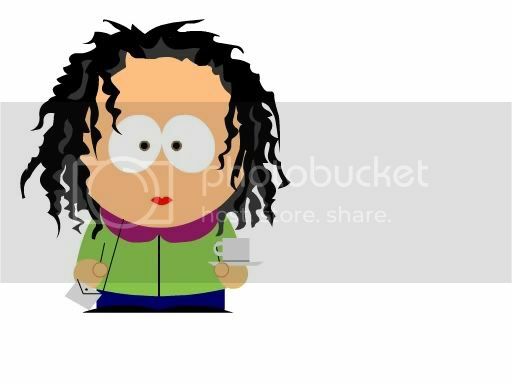 I agree, about the issue, there is so much in there that I want to make. I highly recommend the turnovers. They look charming and homey and they taste great.